SINCE THE BEGINNING OF Christianity, the extension and growth of the Catholic Church were a means to explore, map, and discover the world. Explorations were the first step in establishing missions in foreign lands, the cause of great travels around the globe. The Acts of the Apostles, and also ancient and medieval legends, tell about the missions of the apostles and first disciples in the ancient world (Paul in MALTA and Rome, Peter in Antioch and Rome, John at Patmos in the Greek islands, and the legendary presence of Thomas in INDIA, James the Elder in SPAIN, Joseph of Arimatea in England and Mary Magdalene in FRANCE, among others). Southern Europe, part of Southwest Asia and North Africa were the first places where the new Christian religion propagated. The great moment of the Christian expansion was the Constantine Edict in 313. From then on, Christianity became the official religion of the Roman Empire. This was the start of an alliance between the church and political power that had a great impact on the diffusion of the Christian religion in the ancient world. Charlemagne gave to his Holy Roman Empire a religious mark and contributed to Christian social defense and expansion. The Byzantine Schism in 1054, separated from the Catholic Church the great part of the Christians of eastern Europe and Asia, from then on called Orthodox. With the start of new religious orders in the 13th century (mainly Franciscans, Dominicans, Servants of Mary, Trinitarians, and Mercedarians) and with the organization in religious orders of groups of hermits (Augustinians and Carmelites), the missions had a great push. Thanks to the Franciscan John of Pian del Carpine and Odoricus of Pordenone, Christianity was preached for the first time in CHINA. The new religious orders were also leaders of the expansion of Christianity in America after the Christopher Columbus voyage. With the work of Dominican Bartolomé de Las Casas, Native Americans were accepted as human beings and evangelized. After the separation of part of Christianity from the Catholic Church in the age of Reformation (16th century), Catholicism lost its influence in a great part of northern and central Europe, especially in GERMANY, England, SCOTLAND, a result of the principle “Cuius regio, eius religio” (“the religion of the prince has to be the religion of his people”). The church reacted to the reform of Martin Luther in France, John Calvin in Switzerland, and Henry VIII in England with the Council of Trent and founded new religious orders (Jesuits, Lazarists, etc.) nearer to the pope and less attached to monastic life. The rule of the missions of the Jesuits in India, JAPAN, South America, and CANADA has been very important since then. In 1622, the Congregation of Propaganda Fide was created as the Roman department that had the direction of the Catholic missions. In the 19th century, a great role in the evangelization of America and Asia was played by Lazaristas and Oblates of Immaculate Mary, a religious order founded by the bishop of Marseille, Eugenio de Mazenod. In this century, Oceania had its first catholic preacher in Peter Chanel, a French priest martyrized in 1841 in Futuna, and Africa had great missionaries such as Daniel Comboni, founder of the Combonians Missionaries, and the Cardinal Lavigerie, founder of the order of the White Fathers. With the leadership of Pope Pius XI, Catholic missions had a strong influence in the first half of the 20th century, and in the second half, mainly after the Vatican II Council (1962–65), the Catholic hierarchy was extended to a great part of the world. The Catholic Church had a very important role in the political history of the world. The Pontifical State, created in the first middle age (the first authentic document of pontifical sovereignty dates back to the 8th century), survived until 1870. The pope was the supreme authority of this state, which across the centuries had a different extension: For a long time, it ruled a large part of central ITALY, but since 1861 only the Lazio region has been under its rule. After the union of Italian kingdoms, the pope fought against the Italian government, and only in 1929 was there the Conciliation, a pacification act signed by the Italian premier at the time, Benito Mussolini, and the first minister of the Holy See, Cardinal Peter Gasparri (for Pope Pius XI). With this act, the new state of the VATICAN CITY was born, under the power of the pope, and at this time the Holy See recognized the Italian kingdom. The Holy See has today separate diplomatic relations with the great part of the nations of the world. The Pope is not the only Catholic bishop who had sovereignty. In the past, the bishop-prince of Trento, in northern Italy, was important, and the bishop of Urgel, in Spain, is also today one of the heads of state of ANDORRA. Also Catholic religious orders had sovereignty: Missions of Jesuits in Latin America, before their suppression, were a sort of independent republics. The Knights of Malta, a religious and military order, were sovereign in the islands of Rodi and Malta, and also today they have the sovereignty over the Knights of Malta palace and Church of St. Mary of the Priorate in Rome, and besides have embassies in a great number of nations in the world. The Holy See prefers, in modern times, to have a regulation of relations with nations through special agreements called concordats. The first modern concordat was with Napoleon I in 1801, and today the Catholic Church has concordats with a majority of the nations in the world. In a lot of countries, there are modern political parties that declare their Catholic inspiration, but rarely does legislation adhere to the strictest tenets of the Catholic ethic, such as the prohibition of procured abortion, divorce, and artificial contraception. Catholicism left a great imprint in the culture and way of life in many different parts of the world. Since the first times of Christianity, the enculturation of the new religion with the old culture was a prime effect. Greek and Roman culture, and culture of northern Europe, slowly integrated with Catholicism, with the substitution of the cult of the pagan gods with the cult of the saints. In time, almost everything in society had a special imprint by the religious Christian and Catholic culture. One example is toponymy, the naming of places: In Europe and America, a great number of the names of places remember Catholic feasts, saints, and personages. CALIFORNIA in the United States remembers the work of Franciscan missionaries in cities such as San Francisco and LOS ANGELES (the latter named after Sancta Maria de los Angeles, the place near Assisi where Francis died in the 13th century), San Bernardino, San Diego (names of Franciscan saints). 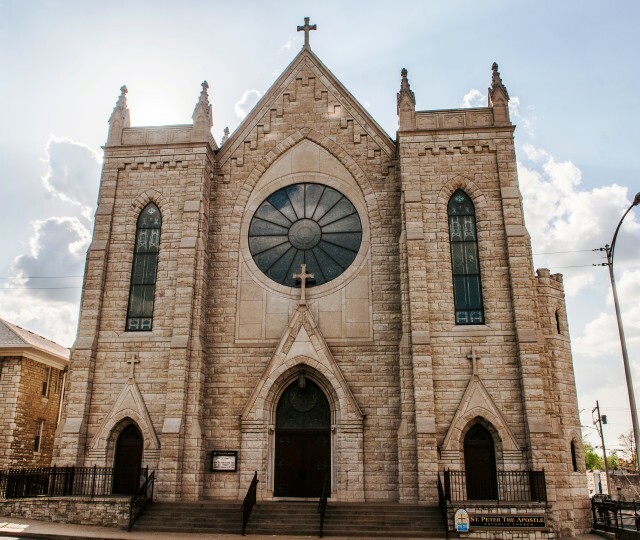 Corpus Christi, TEXAS, commemorates the Catholic dogma of transubstantiation, and the great number of places called St. Mary or Santa Maria are surely an effect of the Catholic devotion to the Virgin Mary. A great number of places have names of Catholic saints: Santa Catalina, St. Helen, Santa Anna, mainly in the places where Catholic missions had a important role in the exploration and foundation of new towns and villages. Another important effect is the diffusion of the names of Catholic saints among the newly converted people; this happened in the past and continues today. Works of art, but also the life of the everyday, were inspired often by Catholicism: towns built around Catholic shrines (Loreto in Italy) or developed nearby (Lourdes in France, Fatima in PORTUGAL, Pompei and San Giovanni Rotondo in Italy). The great cathedrals built everywhere in Christendom were the centers of towns and communities. Religious orders, mainly Jesuits and Dominicans, that collaborated in the past to found very important cultural institutes, have today evolved into preeminent universities and colleges around the world. Other religious orders have hospitals, mainly in Africa and Asia. All this is not to mention the Catholic calendar feasts that have become common holidays (holy days) in many nations around the world. The Catholic Church today is present everywhere in the world, with 1.1 billion baptized Catholics, comprising 17.3 percent of the entire world population (16.77 percent of that population in Africa; 62.71 percent in the Americas; 2.89 percent in Asia; 39.96 percent in Europe; and 26.77 percent in Oceania). It is locally structured in 7,726 dioceses. In Europe, the Catholic presence is very strong, mainly in Italy (227 dioceses), IRELAND (26 dioceses), Spain (71 dioceses), PORTUGAL (21 dioceses), POLAND (45 dioceses), BELGIUM (9 dioceses), Malta (2 dioceses), and France (98 dioceses). In the Irish Republic as in Italy, the feeling of being part of Catholicism is one with national patriotism. In Ireland, the long dominance of the British government and the imposition of Anglicanism as a national religion led Catholicism to be identified in Irish minds as a national resource. In Italy, the presence of the pope and the difference of culture and way of life between the north and south turned Catholicism into a traditional, common cultural heritage for the Italian people. France has a great religious tradition, evident today in the popular shrines as Lourdes, St. Therese of Lisieux, St. John Vianney of Ars, but this tradition has to live together with a strong state laeity, coming from the liberal ideas of the French Revolution and Enlightenment. State and church are completely separated today in France, and this has also some consequence on education, with laws that forbid any symbols of religion (whether Catholic or Islam) in state schools. The Catholic Church in Belgium has to fight the secularization of culture, but it also has important centers of Catholic culture, such as Lovanio Catholic University and the ancient Society of Bollandistes in Brussels, the most important institution to study hagiography. Spain has an ancient and strong religious tradition, as the Holy Week religious manifestations, mainly in Seville, and the famous shrine as Santiago de Compostela testify, but today some scholars point to a decadence in religious practice. Portugal has its religious center in the shrine of Our Lady of Fatima, one of the most visited in the world, and also has a great popular Catholic devotion. In the other nations of northern Europe, except Northern Ireland, where political problems involve too much religion, the ecumenical movement is very developed, and Catholics are in good stead with the other separated Christian churches (various Protestant denominations). In the nations of eastern Europe, the Catholic rapport with the Orthodox Churches is good; only in RUSSIA are there problems with the Orthodox hierarchy, but the situation is getting better. In 2004, the restitution of the icon of Our Lady of Kazan by Pope John Paul II to the Russian Patriarchate of Moscow helped this pacification process. The same pope, John Paul II, was one of the protagonists of the new Poland, after the fall of communism, and Poland today is still a nation with strong Catholic traditions, as evidenced in the popularity of the national shrine of Our Lady of Czestochowa. In AUSTRIA (12 dioceses), there is a demand for a renewal of Catholicism, opposed by the hierarchy. SWITZERLAND (8 dioceses) is only partly Catholic, but it gives to the Holy See the soldiers for the small army of the pope, the Swiss Guard. Also relevant are the Catholic communities in Great Britain (32 dioceses), Germany (29 dioceses), NETHERLANDS (8 dioceses), LITHUANIA (8 dioceses), LATVIA (4 dioceses), ESTONIA (4 dioceses), UKRAINE (20 dioceses), CROATIA (16 dioceses), ROMANIA (12 dioceses), and HUNGARY (16 dioceses). The presence of Catholics in Asia is mainly in the PHILIPPINES (86 dioceses), where the majority of the population are members of the Catholic Church. There are Catholic schools and universities, and Catholicism plays an important part in daily life. In JAPAN (16 dioceses), the presence of Catholics is important, but it is a minority. There are Catholic schools, and Catholic education is appreciated. Catholics of Japan have their own national shrine to celebrate St. Paul Miki and the others Japanese martyrs, patron saints of Japan. In India (149 dioceses), the Catholic presence is small compared with the great number of inhabitants, but nevertheless important. The Malabaric Church dates back to apostolic times, and charismatic personalities, such as St. Francis Xavier and Mother Theresa of Calcutta, promoted Catholicism. SRI LANKA, thanks mainly to the missionary work of Joseph Vaz and Bishop Horace Bettacchini, has several catholic communities, with 11 dioceses. In ISRAEL (2 dioceses) and PALESTINE (2 dioceses), Catholics live in small communities of Arab Christians, and are mostly related to the Franciscans Friars of Holy Land Custody, and other religious communities holding custody of the shrines of the Holy Land. In SAUDI ARABIA and other nations where Islam is the official religion of the state, the presence of Catholics is restricted mainly to the chapels of foreign consulates. In some Islamic countries, there are ancient Catholic communities, such as the Chaldean Church in IRAQ (15 dioceses), or even new communities, such as the Church of Pakistan (7 dioceses). These parishes survive with great difficulties, often discriminated against by the majority. In China, the Catholic Church had a very important presence (145 dioceses) before the Cultural Revolution in the 1970s. Today, Catholicism is restricted, except in HONG KONG. The government of China created a “Patriotic Church,” a sort of Catholic Church separated from Rome, with the aim to bring Roman Catholics into the government-run version. In TAIWAN (13 dioceses), Catholicism is thriving, while in MONGOLIA, a small Catholic community is developing (1 diocese). VIETNAM (25 dioceses), South KOREA (18 dioceses), INDONESIA (37 dioceses), MALAYSIA (8 dioceses), LEBANON (24 dioceses), and SYRIA (17 dioceses) have a good number of Catholics as well, all within countries with majorities from other religions. In Africa, Catholicism is growing, mainly in the center and in the south. The greatest problem of enculturation of Catholicism is still to be solved. For example, the Catholic people of RWANDA (9 dioceses) and BURUNDI (7 dioceses) cannot find a real peace after terrible tribal wars. The greatest Catholic shrines in Africa are the Church of Our Lady of the Peace of Yamossoucro in CÔTE D’IVOIRE (14 dioceses), the cathedral “Regina Mundi” of Port Said, in EGYPT (21 dioceses), the cathedral of Our Lady of the Help of Wau in SUDAN (9 dioceses), the church of Our Lady of Africa of Algeri in ALGERIA (4 dioceses), and the Church of Our Lady of Maromby, in MADAGASCAR (20 dioceses). Religious orders, such as Capuchins, Trappists, Combonians, Scalabrinians, and others have a large number of schools, universities, and hospitals in Africa. In KENYA (26 dioceses), the Catholic University of Western Africa is developing. Cults of local saints are encouraged by the Holy See with beatifications and canonizations, such as St. Charles Lwanga in UGANDA (20 dioceses), blessed Isidoro Bakanja and blessed Clementine Anuarite Nengapeta in CONGO (54 dioceses), and Iwene Michael Tansi in NIGERIA (49 dioceses). Other important Catholic communities are in ZAMBIA (10 dioceses), SOUTH AFRICA (27 dioceses), SENEGAL (7 dioceses), TANZANIA (30 dioceses), LESOTHO (4 dioceses), MOZAMBIQUE (12 dioceses), ANGOLA (16 dioceses), BENIN (10 dioceses), BURKINA FASO (12 dioceses), CENTRAL AFRICAN REPUBLIC (8 dioceses), CHAD (8 dioceses), and MALAWI (7 dioceses). In North America, the Catholic presence is very active. In a place where most of the population comes from European origins, people have preserved their religions from their nations of origin. In CANADA (72 dioceses), most of French-speaking residents are Catholic. Echoing their counterparts in France and northern Europe, there is widespread devotion to St. Anne, who with St. Joseph dedicated the most important Catholic shrines of Canada, including the church of Notre Dame du Cap in Quebec. In the UNITED STATES, Catholicism struggles to maintain its hold in light of the widespread scandal of priests accused of pedophilia. Many U.S. Catholics oppose the dictums and prestige of the Roman church hierarchy. Jesuits are devoted to schools and education. The national shrine for Catholics is the Church of Mary Immaculate of Washington. The United States has diplomatic relations with the Vatican, but not a concordat. In the United States, there are some 18,400 members of religious orders (friars and nuns); Benedictine nuns number about 7,000. This great number of religious people, and the existence of local religious orders, such as the Sisters of the Blessed Sacrament for Indians and Coloured People, founded by St. Katharine Drexel in 1891, seem to portend a positive Catholic force in the United States. Yet, despite these numbers, the number of Catholics in the United States has declined steadily since 1980. And there is a crisis of vocation, mainly in female institutions: American women do not like the secondary role that the Catholic Church reserves for women. Catholic presence in Central and South America is very strong, a result of the heritage of Spanish and Portuguese colonization. Catholics have a good number of universities and schools, even if some nations have a laic state tradition. BRAZIL today has the greatest number of Catholic bishops and dioceses (266) in the world. Catholicism is sometimes mixed with ancient pagan cults, forming a very special way to practice the religion. Great monuments testify to the Catholic faith of Latin Americans: The great statue of Christ on Corcovado (Rio de Janeiro in Brazil) is one of the more famous religious monuments in the world. The shrines of Our Lady of Guadalupe in MEXICO (125 dioceses), Our Lady Aparecida in Brazil, Our Lady of Lujan in ARGENTINA (70 dioceses), and Our Lady of Altagracia in the DOMINICAN REPUBLIC (12 dioceses) are very famous. Also in the other nations of Latin America there are vibrant Catholic communities with their own traditions and devotions, such as St. Rose of Lima and St. Turibio of Mogrovejo in PERU (45 dioceses); Our Lady of Carmel in CHILE (27 dioceses), and others in BOLIVIA (18 dioceses), ECUADOR (24 dioceses), VENEZUELA (39 dioceses), COLOMBIA (75 dioceses), URUGUAY (10 dioceses), PARAGUAY (15 dioceses), GUATEMALA (14 dioceses), PANAMA (8 dioceses), HAITI (9 dioceses), COSTA RICA (7 dioceses), HONDURAS (7 dioceses), EL SALVADOR (9 dioceses), CUBA (11 dioceses), and NICARAGUA (8 dioceses). A theological movement, called Theology of Liberation, has developed in the second half of the 20th century to address pervasive social problems of Latin America. The Vatican opposed the movement’s political aims, particularly using violence to fight for the social needs of the poor, and its adherence to Marxist ideology. Because there is a low number of priests in Brazil, a new catholic society called “Comunità di Base” has been created. In this society, a democratically elected lay person is the head of the religious community, hence allowing for the development of the Theology of Liberation. Sometimes, these poor communities are abandoned by the official Catholic hierarchy. AUSTRALIA (32 dioceses) has a good number of Catholics, the great part descendants of emigrants from Italy and other nations with a Catholic majority. A very important religious and cultural center is the Benedictine Abbey and the town of New Norcia, founded by Benedictine monks in the 19th century. A relevant Catholic presence is also found in NEW ZEALAND (7 dioceses) and in PAPUA NEW GUINEA (19 dioceses), where there is a great veneration for blessed Peter To-Rot, the first local resident to be beatified. The SOLOMON ISLANDS (3 dioceses) and the other islands of the Pacific (17 dioceses) have Catholic communities, too.